Eleven-year-old Cadan Dedear of Houston, left, speaks with his dad as his sister looks beyond the brush Saturday during the start of white-wing dove hunting season at Resaca de la Palma in Brownsville. 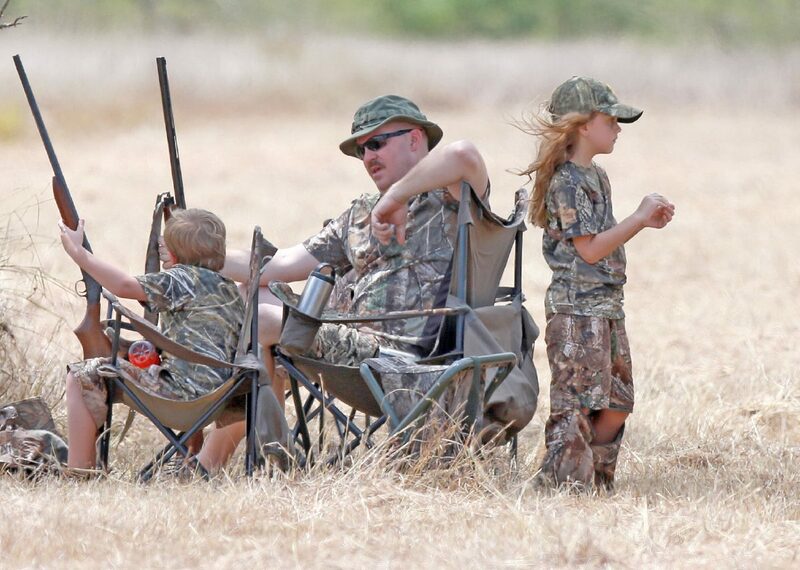 This marks the 5th year the Dedear family visit Brownsville to hunt for white-wing doves. HARLINGEN — Just the right weather at the right time has the Texas dove season poised for a potential above-average season, Texas Parks and Wildlife Department officials say. Hunting season in the Rio Grande Valley kicks off with Special White-Winged Dove Days Sept 1-2 and Sept. 8-9. This early season segment has special bag limits focusing on the harvest of white-winged doves. The general dove opener is Sept. 14, the earliest date to open the wing-shooting season in Texas since 1950. “Much of the state has been very dry this summer, but we had a very mild winter with lots of precipitation which kicked off dove breeding earlier than usual and provided excellent habitat throughout most of the spring,” said Owen Fitzsimmons, webless migratory game bird leader for TPWD. “This year’s mourning dove production was excellent, and white-wing numbers continue to increase, so I expect a fair to above-average dove season statewide,” Fitzsimmons said via email. The three primary species of dove hunted in Texas are the mourning dove, the white-winged dove and the white-tipped dove. Mourning doves are one of the most numerous and widespread bird species with a population estimate of 300 million birds in North America. Populations of mourning dove, white-winged dove and white-tipped dove all are increasing and the birds are listed as “least concern” by the International Union for Conservation of Nature and Natural Resources. TPWD’s Fitzsimmons says the dove population in Texas and the Rio Grande Valley was boosted by a confluence of weather and rainfall which created near-optimum dove conditions this year. “In the RGV and South Texas in particular, the heavy rains in June came at just the right time to provide fantastic habitat for dove season,” he said. “Our biologists in the field are reporting that dove fields and native habitats look incredible and are producing a ton of food. “With the Sept. 14 opener and Special Whitewinged Dove Days this year, South Zone hunters can hunt every weekend in September, and I anticipate that they will have great hunting early on in the season,” he added. The early season start this year has answered one of the prime complaints of Valley wingshooters, namely that the best shooting comes early in the season and then often fades as birds become scarce.